The very first camera to bear the Nikon name, and the camera that introduced the power of NIKKOR optics to a generation of photographers, was the Model 1. Now, to celebrate Nikon's 100th anniversary, the Model 1 has been exquisitely recreated in crystal from renowned crystal maker Swarovski®. Nearly full-scale, this stunning collector's item features the finest details of the Model 1, from the engraved Nikon logo, lens lettering and original company mark to a special crystal treatment to represent the dark and artificial leather portions of the Model 1. 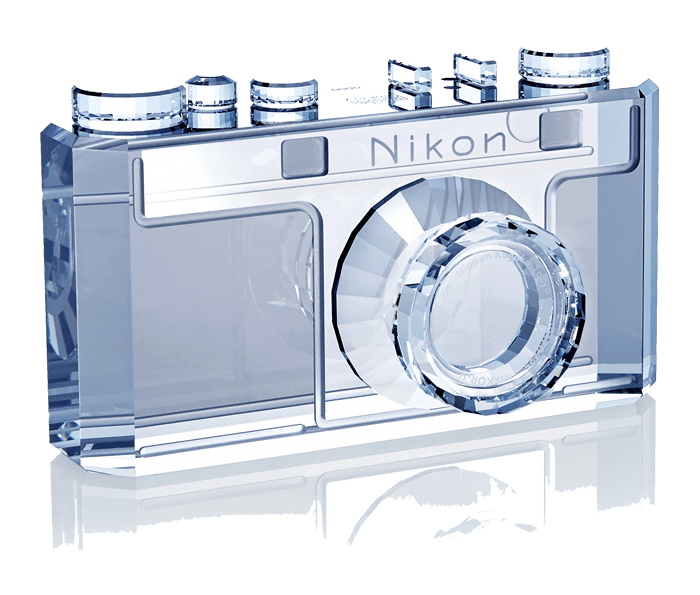 Available in a limited quantity, the Crystal Creation Nikon Model 1 is sure to be sought after by the most discerning collectors. To celebrate Nikon's 100th anniversary, the first camera to bear the Nikon name, the Nikon Model 1 has been exquisitely recreated in crystal from renowned crystal maker Swarovski®. Nearly full-scale, this stunning collector's item features fine details of the Model 1, from the engraved Nikon logo, lens lettering and original company mark to a special crystal treatment to represent the dark and artificial leather portions of the Model 1. Available in a limited quantity.